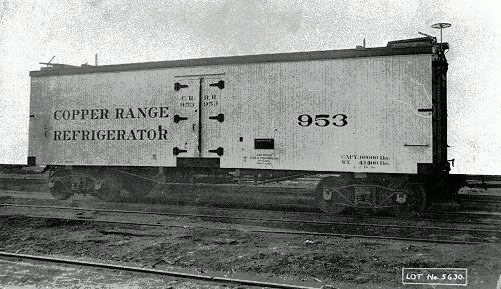 Copper Range RR Refrigerator Car #951 with Copper Range box car #151. Image acquired from an 8" high by 54" wide circuit camera view. Not exactly sure what is going on in the foreground, but who cares as all I ever focus on are the Copper Range cars. Circa 1911-13. From the Kevin E. Musser Collection. The Copper Range certainly had an interesting collection of equipment. Modeling this equipment is a hard thing to do. Not much in the way of affordable rolling stock that is available for a reasonable price other that some roundhouse box and refers. Never saw a refrigerator car before that had the ice hatches in the middle. If you iced it first, the ice would fall out when you opened the door to begin loading. Did it arrive at its destination with ice in the center yet? What was the logic behind this? The center hatches on #951 are a Tiffany Reefer design begun in the late 1870's or early 1880's... 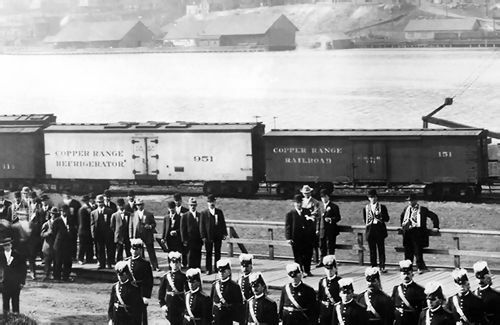 It proved successful and was employed by other Car Builders for a number of different RR's... which had ice loading facilities to accomodate this design... (Thanks to John Campbell for his insight on this one). Yes, the Copper Range had some interesting cars. The refers are just an example. Check out #953 which had hatches on the ends. Can't imagine the dismay of the employees who had to figure out which car they had and where to load it.